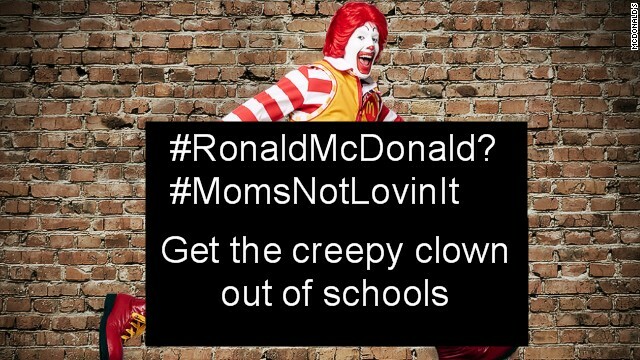 Will you help us hijack #RonaldMcDonald with #MomsNotLovinIt? Of all the problems McDonald’s had to fix, they chose to update the clown’s outfit. Let’s change the conversation from what Ronald is wearing to the company’s unethical practices like using schools to market to kids. You can also visit Moms Are Not Lovin’ It! for additional ways to help. Already our efforts are getting noticed. The Today Show mentioned #MomsNotLovinIt in their coverage of his new outfit (at the 2:15 mark). Below are just some of the organizations and people who have helped to get the word out. Please join us! Tags: #MomsNotLovinIt, #RonaldMcDonald. Bookmark the permalink. Previous post ← Gummy Bears for Extra Credit?